I’ve really been enjoying Architectural Digest and with the April issue I was over the moon because it featured one of my favorite Spanish interior designers ISABEL LOPEZ-QUESADA. Isabel completely gutted and redesigned her Madrid home which was once a wax factory and the results are stunning. 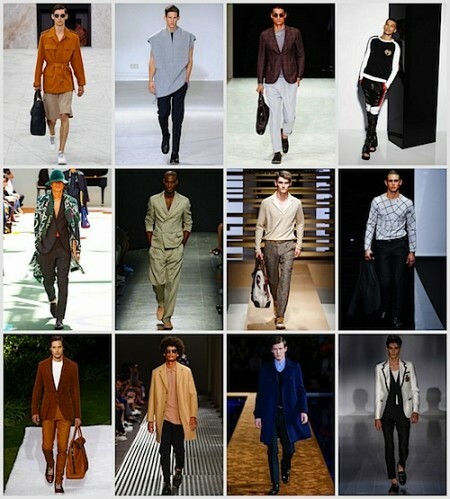 It’s definitely going in my design file for future reference and I thought I’d share it with you too. 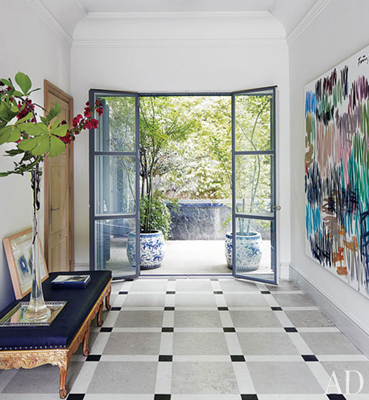 In the entry hall, Isabel proves that fearless style is all in-the-mix with an over-sized abstract by Günther Förg on one wall and an antique Swedish bench on the other. 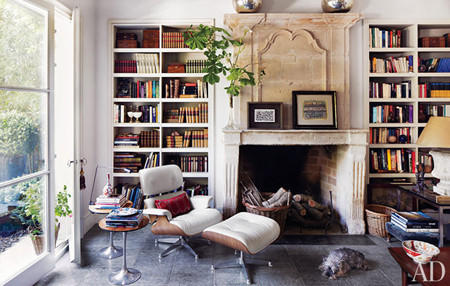 In the living room, Isabel designed the clean-lined sofa with a steel base and paired it with an antique mantel and a striking French bookcase. I love how the doors have shutters rather than curtains and are thrown open to allow fresh air and abundant light into the room. 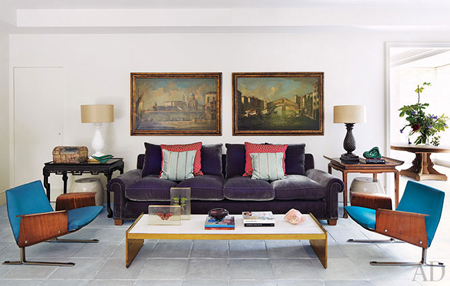 In another seating area, Isabel’s use of an unexpected blue leather on the mid-century chairs coupled with Asian side tables are the perfect complement to vintage artwork on the wall. And while the mid-century chairs may be a tad uncomfortable over a period of time, Isabel thoughtfully added a cushy sofa perfect for a siesta. 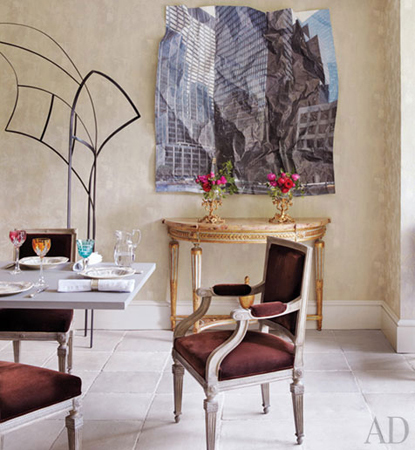 In the dining room, Isabel continues to mix elements by combining traditional Louis XVI chairs with a more contemporary sandstone-topped dining table. 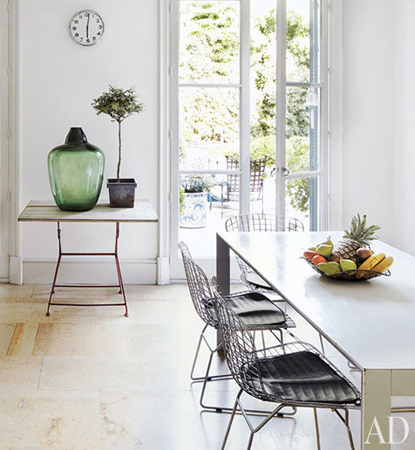 For her kitchen, Isabel chose a steel-topped breakfast table along with chairs by Harry Bertoia. Libraries are always a favorite for me because I love to peek at the books people collect. Clearly, the Quesada’s dog, Pepe finds the library relaxing and the perfect spot for his afternoon siesta! I love Isabel’s bedroom because of the mix of raw materials–the oak floors and four poster bed, the mirrored nightstands, the brass and ceramic lamps, and the mix of textures on her bed. In Isabel’s closet and dressing area, an antique desk is used as a make-up table and a comfy chaise make getting dressed for an evening out in Madrid relaxed and fun. In her master bathroom, a massive picture window and a deep soaking tub perfect for daydreaming. 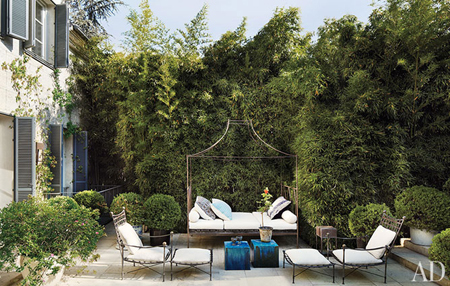 Isabel’s courtyard provides ample inspiration. 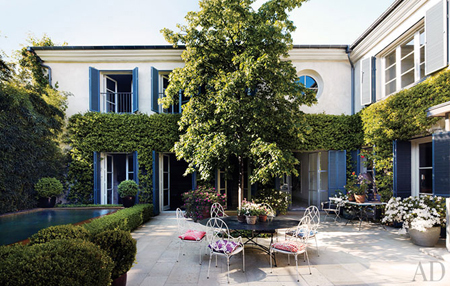 I love how she used French iron furniture and her mix of boxwoods, topiaries and terracotta potted flowers and plants. Is this not perfect for an afternoon spent outside reading a book or hanging with friends? Isabel’s antique day bed and chairs with ottomans and the garden wall planted in green abundance is inviting you to laze around all day.